Your Home and Office Delivery Specialists. "Handling Fine Furniture since 1962"
To provide a reliable and quality furniture delivery service in Ontario predominately in the GTA. We want to provide excellent service for furniture manufacturers, furniture retailers and also for interior designers that arrange pick-up and delivery or other services we offer for their clients. To include providing top notch warehouse services and facilities. Our warehouse receives furniture from local as well as worldwide manufacturers for delivery, storage or for any of the other services we offer. Our Team consists of a group of experienced staff ready to service you and your needs in the furniture delivery business. Efficient pick-up and delivery of home and office furniture, specialising in fine furniture. We are licensed and insured with the basic trucking insurance with upgraded insurance available upon request. We are always in good standing with the Workplace Safety and Insurance Board. 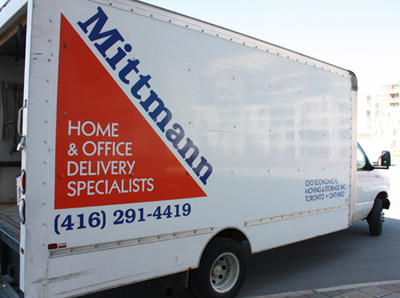 At Mittmann Furniture Delivery we specialize in pick up, delivery, placement and basic installation of fine home and office furniture. We also offer warehousing and storage services. Our goal is total customer satisfaction.